So the only real big game hyped up in the area this week is Kansas State taking on Iowa State at Arrowhead Stadium. The other local teams are on break and getting ready for conference play next week. This is a great opportunity for these two teams to showcase themselves (on a national spotlight even). Both programs are suffering a bit right now. Both of them will be run centric and defense heavy. Both have new coaches (albeit one is returning). 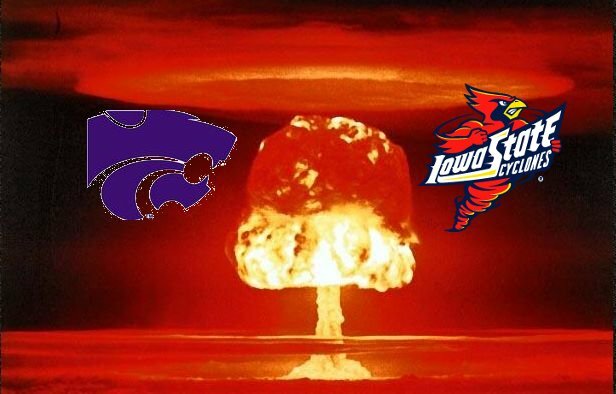 Both teams were projected to be in the cellar of the Big 12 North this year. Well it may not mean much for everyone else, but it means the whole season for these two team. For Iowa State, they’ve always been in the shadow of Iowa for years. Sure, there’s been times when the Cyclones were up and the Hawkeyes were down. But last year and especially this year, Iowa State is taking a back seat. They axed coach McCarthy last year and ended up with what looks like a trade with Auburn. McCarthy went on the head coach the Tigers where Iowa State got defensive coordinator Paul Rhodes. It’s a new regime for the Cyclones and expectations are that this guy will be instilling defense into a league that forgot how to spell it. Meanwhile, Manhattan’s favorite son has returned in the form of Bill Snyder 2.0 to build back the program that was once a national title contender. After the embarrassing skid mark that was Ron Prince, Snyder 2.0 is back to bring street cred back to the Wildcats. And he’s doing it in the same way that Rhodes is trying to do up north. Defense and a big ole running game is what was missing last year and Snyder 2.0 is hell bent on bringing it back. Fortunately he has help in a JuCo transfer by the name of Daniel Thomas to help lead the way. So today’s game is much more than deciding who will share the cellar with Colorado in the Big 12 North this year. It’s a progress game. The winner will have a better shot at making the most improvement this year. The loser will have to eat it and plan on building for much longer. Being the Kansas State grad that I am, I’m pulling for Snyder 2.0. But I think the fact that I’m not going to Arrowhead shows just how close this game might be. Let’s hope it’s not on ugly game on both sides of the field. Now off to the bunker. IT’S FARMADGEDDON!